Until recently I bought the more expensive radios but times have changed. Now less expensive radios perform so much like the super radios that it is hard to justify spending the extra money. We don't need to spend a lot of money to get a great reliable radio with a lot of features any more. Other electronic parts are also more economical than they have ever been before. Check our web site Parts List - If I Were Starting RC today to get our list of high performace but economical parts that can be used with our planes. The picture on this page is of the 2.4 gHz Flysky i6 radio. I have flown for over 40 years and recommend this radio for the beginner to advanced flyers. I own two of them and if I were buying another radio I would buy a third. Let me tell you why it is such a great deal. This is a 6 channel full function radio with a 20 model memory with receiver including shipping for less than $50. This is less than some companies charge for just a spare receiver. Other people like it too. 95.8% of all customer reviews give it 5 stars!!!. You can get the Flysky i6 radio with a FS-iA6B receiver from Banggood, Amazon or Ebay. Watch the videos at the bottom of this page for a great explaination of the features of this radio. ​FS-i6 extra receivers with telemetry are only $9-$14 shipped!!! Compare that price to the competition!!! I like the Flysky 2.4 6ch FS-iA6B receiver style the best because the servos plug in the end of the receiver and makes installation in a flying wing and in most plane configurations easier. Extra receivers make it so you can have up to 20 different planes that all fly off one transmitter. There is a FS-i6X version of this radio out there. This is a more complex radio that has extra i-bus receiver that is designed for the multi-rotor quads. I don't have enough knowledge of this variation to know if it will work as well for us as the FS-i6 system. The FS-i6 works with a trainer cord to help you teach new flyers to fly. The trainer cord ties two transmitters together so a beginner can have the confidence of flying on one transmitter while an experienced flyer is in control on another. The buddy cord option is why I like to own a second FS-i6 transmitter. I like to use a buddy cord set up with my FPV gear ups so I can let others fly FPV while they wear goggles while I fly LOS to keep them from flying away. The FS-i6 has as great of line of sight performance as any of my 2.4 gHz more expensive radios. This radio has telemetry so the receiver tells the transmitter when the battery is plugged in to the receiver and tells you the receiver voltage on the transmitter!!! In other words the receiver is sending information back to the transmitter for two way communication. My expensive radios don't do this. There are other telemetry options also available. The FS-i6 receiver binds almost instantly to the transmitter. This is very important if you ever loose your radio connection while flying. Most RC radio transmitters take several seconds for the receiver to find the transmitter again so if you have a radio glitch your plane may crash while the receiver is looking for the transmitter. The FS-i6 reconnects so fast you may not even know there was a glitch. I also own another more expensive brand of radio that takes almost 5 seconds to find the receiver. In 5 seconds a plane can fly away or crash if it isn't getting a signal from the transmitter. The Flysky i6 has a double diversity antenna on the receiver and the FSi6 is unique because it has two antennas in the transmitter. The transmitter has one antenna that is vertical on the back of the radio and one that is horizontal in the handle. I'm not exactly sure how they work together but I have never had any trouble. I like the fact that the transmitter antennas are built into the transmitter case and don't break off like some of the other radio transmitters out there. You position the receiver antennas in the plane at 90 degrees to each other so it makes it so you always have a good angle for the antennas to send and receive signals. I have liked shorter receiver antennas on some of the other brands of receivers but I understand the advantages of the longer antennas which give more options of how you can set up and separate the antennas on your plane for better reception. The FS-i6 programming is a little odd but so is every other RC radio I have owned. Now that I am used to it I can jump through menus quickly and know how to get what I want. The FS-i6 has a lot of options and I can't think of anything I need that it doesn't have that I need but I have heard a couple of flyers say they wish it had a timer built in. It has a 20 model memory so you can use one transmitter with up to 20 different planes and it will remember the last settings you have programmed in for each plane. You do need a separate receiver for each plane. There are videos at the bottom of the page that will show some programming set up options. I think they should have named the OK button on the transmitter the Select button and called the Cancel button the OK button to make set up a little more logical but once you are used to what they do you can easily set up your plane. The FS-i6 is built well. The trim tabs seem more durable than some of the more expensive radios I have owned. The control sticks have the right amount of tension and have adjustable length and feel good in the hands. It has an LED lighted screen and digital volt meter that shows up on the screen. I like that it doesn't use a roller dial to roll through options but just uses up/down buttons and an OK or Cancel buttons that are easier to use once you figure out what they do. This is something that is worth mentioning because I have had to send several transmitters of other brands in for service because of broken roller dials, antennas and trim tab switches. The servo plugs on all generic and brands of ESCs and servos work with the Fkysky i6 receiver. This transmitter only weighs 18 oz!!! My other transmitters weigh over 30 ounces and feel twice as big in my hands. I like the smaller size. It is easy to hang on to. I have been waiting for a long time for someone to sell a full function RC radio with a smaller transmitter. I have always felt the transmitters were bigger and heavier than they needed to be since they are mostly empty space inside. I get teased by a few flyers in the club who think I am flying a toy radio because it looks so small, but I fly my planes faster and farther and do more aerobatics than almost any of them and have not had a radio failure yet. This is the best full function transmitter/receiver deal on the market and makes RC more affordable for all. I would bet this is the best selling radio in the world right now. Part of the reason it is priced so low is it is sold through discount houses rather than through hobby dealers. The Flysky i6 does not have built in rechargeable batteries. It uses 4 AA batteries which I thought was going to be it's downfall but the 4 AA batteries last a long time. I carry a couple of replacement sets of alkaline AA batteries with me and can change the batteries out in less than a minute. I fly a lot and get a month or more of flying on a set of batteries plus you can get a 4 battery external AA recharger if you want and still use rechargeable batteries. We spend so much time charging batteries in RC that it is no big deal. I like being able to switch out batteries at the field. I have had too many times that I have left a transmitter on ran my batteries down and not been able to fly that day. It will never happen with this radio. I look at this as almost a disposable radio. If it broke would it cost more to send it in for service than to replace it? I probably would just replace the radio at this price but so far I have not had any trouble of any kind that needed servicing. Replacing it would also give me and extra receiver plus save on postage. Recently I saw the FS-i6 with my favorite "B" receiver (with the servo plugs on the end and not on the top) on sale for $43 shipped from Banggood. If you want to see the radio in action look at my personal Rebel, Vertigo, Bullseye and Bandit videos. They are all flown with the Flysky i6 transmitter and receivers. Avoid the complex top end "open source" radios like the Taranis radio unless you are a computer programmer and can modify your own code. For your first radio you want a radio you can turn on and have it work. This radio can be updated but don't do it unless you really know what you are doing. It is easy to mess up your programming. Flying wings are flown with 3 channels which would be a throttle, and two elevons. The slow flyers use 3 channels which are throttle, elevator and rudder. A sport plane might have 4 channels which would include a throttle, ailerons, elevator and rudder. As you get more complex planes you may add flaps, retracts and a bomb drop. The more complex the plane the more channels you may want. Most new radios have programs installed so they can also fly helicopter. The transmitter (Tx) and receiver (Rx) you choose will be your only link to control your plane. You need a reliable radio that has the function options you need for your planes. I've flown for over 40 years and have owned a lot of different radios and most worked well. The new radios are more reliable than they have ever been. In the USA we fly "mode 2" radios with the throttle on the left stick. Make sure you get the right mode radio for your country when you order. All brands of radio that have elevon, V-tail or sometimes called delta mixing can be set up to fly our flying wings. If you are buying our Albatross, Pelican or Storm Chaser any 4 channel radio will work. If your radio is old make sure it is on a frequency that is still is legal to fly. The new 2.4 gHz RC radios rarely have the interference problems we had in the past with the old frequencies and radios. The new transmitters have a memory so you can save the last settings of several of your planes in one transmitter.​ Some transmitter will store as many as 60 planes in the memory. You select the plane you want to fly and put a battery in that plane and you will have a radio signal only to that plane. It makes it easy to switch back and forth between planes at the flying field. These radios make it possible to fly a variety of planes without having to buy a transmitter for each. You still have to have a receiver for each. Receivers are sold separately but you need to make sure the receivers you buy are work with the transmitter you are flying. The newer radios use a 2.4 gHz frequency. Older radios which are still legal to use but not as common anymore use AM and FM 72 mHz. You can tell the difference at your flying field because the 2.4 gHz has short antennas on the transmitter and receiver. You can also fly on HAM band but you have to have a technician HAM license to do it. We used to have to carefully check our 72 mHz frequencies and HAM band to make sure two radios on the same frequency weren’t turned on at the same time which would cause both planes to crash, but technology has changed in the last few years. The new 2.4 gHz radios automatically change channels when there is interference, so multiple flyers won’t interfere with each other. We have flown 50+ planes at the same time in combat without radio interference between the flyers. There are many good radios out there. We have used the mid priced ($200) Spektrum DX6i transmitters and a variety of receivers in a wide variety of planes. I have 4 of them. Spektrum has some of the best customer service out there. I have also flown Futaba and JR radios. I have never used more than 6 channels so don't let the ads fool you into buying more unless you are flying extreme planes with a lot of options. Flying wings only need 3 channels with mixing. A traditional plane with retracts only needs 5 channels. Be careful with some of the older radios. I know there are older radios out there you want to dig out of your closet and use. Many of these older radios get interference from the electric motors. I learned this the hard way with my “gold sticker certified” Futaba AM Attack 4 radios. If you are trying an older radio, cutting the throttle will usually stop the interference problem if it is from the electric motor and speed control. I advise you simply stick with a newer radio technology. There are many good radios available but look at the price they charge for their receivers before you buy. We have 5 of the Spektrum Dx6i radios and have had good success with them over years of flying. We have liked the service from Horizon Hobby who services them. We do not like the excessive price of the stock Spektrum receivers. I fly with the cheapest receivers I can find because I have radio in over 50 planes. I can't afford $40-$60 for every receiver. I have not had trouble with the $10 orange receivers, in fact they may be better than the stock receivers. The advantage of two antennas on the receiver comes from the antennas pointing at different angles so there is always an antenna at an angle that can see the transmitter antenna and signal. This also is the same idea that is used with the satellite receiver. I make sure the antennas are pointing different directions. I usually try to point one antenna straight down for the most consistent angle to the transmitter antenna. The bigger planes get farther away and don't look so far away so I want to increase range especially with the FPV planes. Each brand of radio has different programming menus, so look at your on screen display, in your manual, or online or even on youtube, to find the specific steps to program your radio. Carefully look through the menu on your transmitter. Often the information can be found in the multiple set up menus there. Once you learn how to scroll and accept programming becomes much easier. You will need to know how to bind your Tx to a Rx. This process tells your transmitter and receiver that they are supposed to be listening to each other and working as a team. You will need to know how to reverse servo directions and how to do elevon mixing set ups on different radios. To set up proper radio programming for flying wings you will need to set up elevon mixing which is a mix of the aileron and elevator on the right stick of your transmitter. Your throttle will be on the left stick. Many radios have mixing options already programmed in and may offer "Mixing" where you choose and program which channels you want mixed. Most radios offer pre-programmed "Elevon" mixing" or "V-Tail" or "Delta" mixing if you search through the menu. Once you have the best mixing option chosen and you have the two servos plugged into the aileron and elevator plugs on the receiver. You will need to use the reversing switches to get the elevons moving in the right directions. 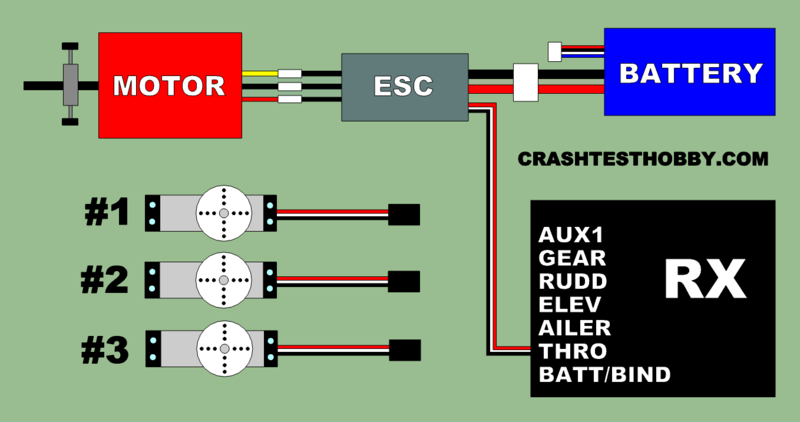 If you can't find a way the reversing switches give you the proper directional movement, trade the servo plugs in the receiver and try the reversing switches again so the elevons move as in the diagram below. There are 8 different ways the elevons may move with the plugs and reversing switches and only one of them will work. Your radio may give you the choice of mixing ratios of aileron to elevator.​ With our planes I usually set them up as 50% / 50% and then program the travel adjust or end points to get the specific amount of movement I like on my planes. You can also program in dual rates along with of the mixing so you can flip he Aileron DR or Elevator DR switches on the transmitter to increase or decrease how much movement the elevons have when you move the sticks on the radio. Some people like this if they have a lot of movement for stunts but want less movement for more stable take off and landings. ​There is also the option of programming Exponential into the programming which makes the movement of the elevons increase the farther from center the stick moves. I have seen the expo function make planes harder to fly but I know some flyers who use it. I personally do not use expo. ​The Spektrum DX6i has some programming quirks. It has elevon mixing programmed in but the program is written so the trims affect the mixing ratios so I usually manually mix the ailerons and elevator on this particular radio. Click this link for instructions on Spektrum DX6i programmable mixing. Different brands of radio receivers have the plugs in a different order. Some receivers have the throttle first others have it as channel #3. Some have the bind plug first and others have it last on the receiver. You will get to know your radio configuration. It is critical to program how much the elevator, aileron, elevons and rudder move when you move the stick on the radio. How much they move is called the “throw.” If they move too far, they will cause snap rolls and erratic flying. If they don’t move far enough, you won’t be able to control the plane and flying won’t be very enjoyable. Many of the problems flyers have, start with how they hold their transmitter. Don't use your thumbs to fly your plane. Pinch the sticks of the transmitter on at least the side with the elevons or ailerons-elevator control. This gives you more than one point of reference as to where the stick is and keeps you from accidentally over-controlling the plane. I can tell from across the field when someone is flying with only their thumbs only on the sticks. Their flight path is erratic and jerky and it lacks the smoothness and precision of more controlled flight. They tend to bump the sticks and the plane looks out of control. Don't bump the sticks!!! It makes you look like a beginner and feel out of control because you will move the stick too far and too fast and the plane doesn't have time to react. This flight problem has nothing to do with the plane but is solely due to the way the pilot holds the transmitter. If you run into problems, get help from an experienced flyer. If you have questions specific to a CTH plane, please contact us.